Gas prices were higher than in the movie, but Reno always takes advantage of special events that go on through-out the summer and none of them are bigger than Street Vibrations which brings in motorcycle enthusiasts from all over the world. This year was no exception as the warmer than normal riding weather meant tens of thousands of people turned out for the 18th annual event and they were looking to spend their money! Over the last 11+ years I think I’ve missed the Street Vibrations Rally only once. The event typically marks the last long ride of the season for our posse. The rain and cold winter weather will quickly kick in and last for several months limiting trips to the few dry riding days. I’ve seen the event evolve over the years. Some of the changes were not well received (see HERE) to say the least. In 2010 there was club-on-club taunting during the day on the Virginia Street sidewalks (see HERE). And then last year someone “pee’d in the pool” so’s to speak with that Sparks shootout. Now for the first time ever visitors are not allowed to wear patches. In fact, Roadshows Inc., the event managers for Street Vibrations, has a provision in its “Exhibit Space Contract” for this rally that “No club colors may be worn or sold in vendor booths.” This is similar to the Laughlin River Run riot ten years ago and the changes implemented there after the biker club brawl. And just as I predicted last year the Street Vibrations Rally is now a ‘No Colors’ event and will be going forward. For those of you new to the blog…the ban on motorcycle club insignia was the result of the shootout between members of the Vagos and Hells Angels Motorcycle Clubs inside John Ascuaga’s Nugget Casino in Sparks. Jeffrey “Jethro” Pettigrew, the President of the San Jose charter of the HAMC died of wounds he suffered in the fight. The Vagos, Leonard Ramirez and Diego Garcia were also shot. Two others, Vago Ernesto Manuel Gonzalez and Hells Angel Cesar Villagrana are awaiting trial for participating in the fight. Gonzalez is accused of killing Pettigrew and Villagrana is accused of shooting Ramirez and Garcia. It’s been reported that former Vago Stuart Gary “Jabbers” Rudnick, actually started the fight with Pettigrew and he has agreed to cooperate with the prosecution of Gonzalez and Villagrana and is now free. But, the above carnage is old news. This year there was a noticeable increase in law enforcement presence in and around the various venues for Street Vibrations. The “no colors” policy and signage were highly visible and hotel security was clearly beefed up. I visited left money in several of the casinos and observed a few club members wearing “soft” colors in a couple of the casinos, but it was fairly limited. One item most noticeably missing at this year’s motorcycle newly labeled “family friendly event”… was the typical large contingent (30+) of HAMC members bristling and posturing in and around the Silver Legacy Casino bar at the foot of the antique mining rig set. Street Vibrations is the second largest motorcycle rally in the west. 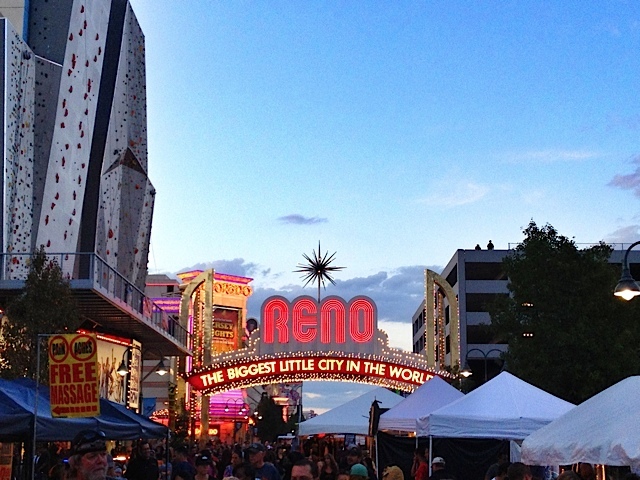 It’s the fourth largest event in the nation and includes activities in multiple locations in Reno, Sparks, Carson City and Virginia City, Nevada. And as you might expect with any large motorcycle gathering it increases the opportunity for accidents and other issues to occur. And there were plenty. There were fewer crashes, but more than twice the number of arrests than last year. For 2012 there was a total of 65 crashes investigated in the greater Reno-Sparks area. Of the 65 crashes, 25 resulted in some type of reported injury and the remaining 40 were reported as property damage only. These numbers are down from last year’s 84 crashes with 49 property and 35 injury. However, this year there were 54 motorists arrested during the Rally period with 27 motorists arrested for DUI and the other 26 related to warrants, misdemeanor or felony arrest. These numbers were up from last year’s 23 arrests which were 16 for DUI and 7 related to warrants, misdemeanor or felony arrests. There was one motorcycle fatality crash on Plumb Lane Sunday morning that reportedly was the result of a truck running a red light. The 2011 stats HERE and 2010 stats are HERE. I want to provide a big shout-out to Richard Tapia, the Carson City Harley-Davidson dealership owner. The “Carson Event” in my viewpoint is really setting the tone and direction of where the event is heading as part of the area-wide Street Vibrations motorcycle festival. 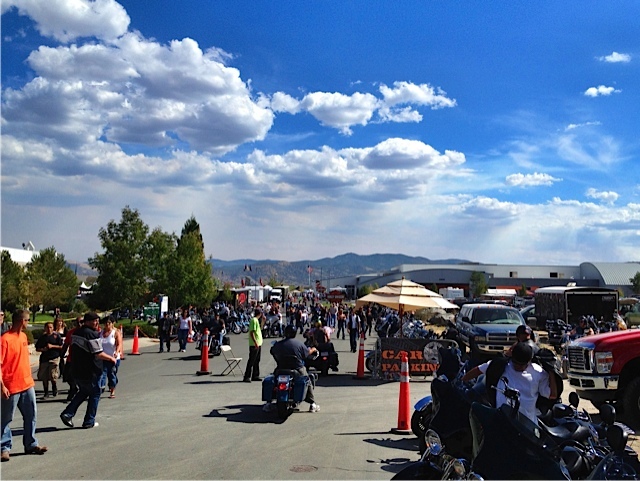 There were more of the big vendors like you’ll find in Sturgis along with the big vendor trailers in Carson City. Not to mention a bunch of activities aimed to wow the crowds. Yes, the HAMC were very visible as part of the Cathouse Run, but so were the employees of the Cason City Sheriff’s office who were selling support your “black & white” t-shirts in a vendor booth in the parking lot. 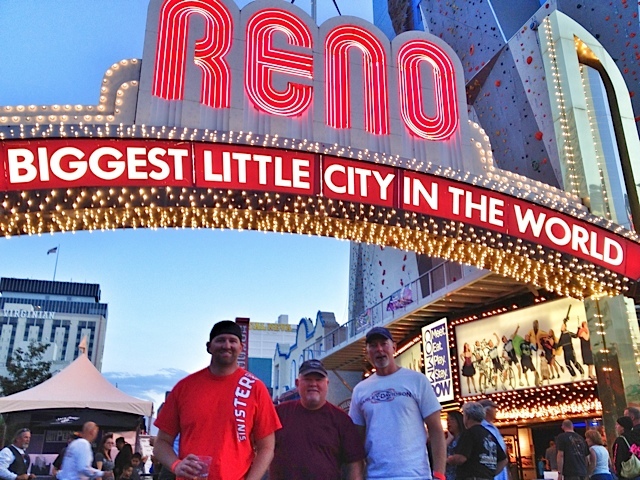 Downtown Reno (Virginia Street) was a disappointment for me when compared to the Carson City event. There were only a couple of what I’d consider to be tier-1 vendors on Virginia Street like Corbin Seats. It was great to meet/chat with Mike Corbin. Other than the food stalls many of the vendors were on par with a motorcycle parts swap meet. Sparks was a lot better, but Carson City was top notch. However, staying in downtown hotels at the greatly exaggerated prices means were paying for proximity and access. The lack of high-quality vendors on Virginia Street might be a ploy driven by the casinos to keep people on the gambling tables, but in my view if the quality level of Virginia Street vendors don’t greatly improve folks (including me) will migrate out of downtown and this will become the Carson City Rally!